Students entering fifth grade will have the opportunity to choose a band instrument and to be involved in a fifth grade band. Students need to commit to one year on the instrument and do not need any prior musical experience. They will also be encourage to pursue private lessons on a weekly basis to strengthen their skill on their instrument through one on one instruction. Students entering sixth grade will have the opportunity to choose a band instrument and to be involved in a sixth grade band. Students need to commit to one year on the instrument and should have one year of playing experience already on the instrument. They will also be encourage to pursue private lessons on a weekly basis to strengthen their skill on their instrument through one on one instruction. Students entering seventh through eighth grades will have the opportunity to choose a band instrument and to be involved in middle school band. Students need to commit to one year on the instrument and are required to have at least one year of prior experience on the instrument. They will also be encourage to pursue private lessons on a weekly basis to strengthen their skill on their instrument through one on one instruction. 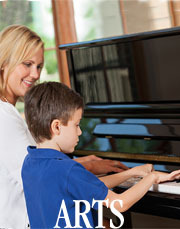 Students are encourage to pursue private instruction on their instrument on a one on one basis. The individualized instruction will help in a variety of areas including his/her ability to read musical notation, hear pitches and recognize them, and strengthen their embouchure and physical endurance while playing the instrument. Many music stores have information on private instructors. Part of the student's grade in band is calculated on their time spent practicing at home. Students will receive information on practicing at home during the first week of band instruction. The recommended practice time is thirty minutes five days a week or 150 total minutes per a week. Flute: The flute is the soprano of the woodwind family. It plays the highest notes next to the piccolo. Flutes have been a part of the band for a very long time and have a beautiful sound that can be light, happy, or quiet. It was featured as the bird in "Peter and the Wolf". Clarinet: The clarinet has a very mellow sound. Students that begin on the clarinet can transition to other woodwind instruments later on in their careers such as the saxophone, oboe, or bassoon. It is best known for the part of the cat in "Peter and the Wolf". Trumpet: The trumpet is the highest of the brass instruments. Brass instruments are excellent for students who have a good sense of pitch. With only three valves, students can make different notes using their lips. French Horn: This instrument has a very mellow sound that is beautiful. It is a series of rolled up tubing that plays a medium voice in the brass family. Baritone: The baritone is smaller than a tuba but with a similar low sound. It helps keep the beat in the band as well as supporting the band with it's sound. Students who play the baritone may choose to play the tuba later in their musical journey. Trombone: The trombone is known for it's use in jazz music and marching bands. It has a slide that can make interesting sounds along with beautiful music. It also requires a student with a good sense of pitch. Percussion: Students who choose to play percussion are choosing more than just playing drums. Percussionists usually begin by learning to read music while playing the bells. From here, they move on to the snare drum and other percussion instruments. Percussionists are students who like a lot a variety or get easily bored.